Description: A tale of growing up in high school. High School students Taku and best friend Matsuo are figuring out what they'd like to do with their lives when a girl named Rikako transfers into their school. 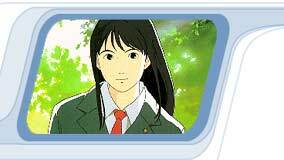 Rikako is a smart, charming and sophisticated girl who had to move away from her urban surroundings, to sea shore country side village. But she has troubles of her own. I Can Hear the Sea is a great anime done by Studio Ghibli. It's definitely one of my favorites. Unlike most typical Japanese anime, this is a story that can be acted out in a film by the normal, average human beings. (Although I'm not sure it would be better if acted by real human beings.) It has no flying robots that uses some kind of high-tech laser guns nor superman-kind- of-like species with supernatural powers who are always trying to save the world. I Can Hear the Sea is a very peaceful and sweet story. It's about this guy named Taku Morisato who likes this girl named Rikako, but his best friend Matsuo also likes her. Yes, it's kind of like a love triangle thing, but that part doesn't play a big role at all. The story may seem a bit boring, but it is intimate and touching (somewhat). The scenes are DEAD GORGEOUS and the music is very good. So, just watch it! In the midst of all the sci-fi and action fantasy stuff, this closer-to-reality anime stands out, and I have to stress that it is REALLY REALLY GOOD. I Can Hear the Ocean is a drama set in mundane, real life. There are no fantasy or science-fiction elements, no life-threatening situations, no world-shaking crises. Just young adult people, maturing, coming to terms with themselves, each other, and their lives. Rikako comes to Kouchi with her mother after her parents' divorce. Rikako hates being away from Tokyo. She despises the people in Kouchi and their accent, which reminds her of samurai movies. She feels, and she remains, isolated from most of the other students at the school. She wants to go back to Tokyo to live with her father. As a first step, she plans to visit her father secretly, and she uses manipulation and subterfuge to get Taku and others to provide the money and the opportunity. She ends up visiting her father with Taku, but her dream is shattered. In the meantime, Rikako is growing out of her childish big-city smugness, Matsuo is falling in love with Rikako, and Rikako and Taku are developing feelings for each other. It turns out to be a love-triangle story about Rikako, Taku, and Matsuo, but handled in a very original way. As such, it is very well done and highly recommended.